The central pane is the area where details about the elements involved in studies and experiments can be viewed. It is also the area where chromatograms, simulation grids, parameter optimizations, and other analysis tools will be displayed. 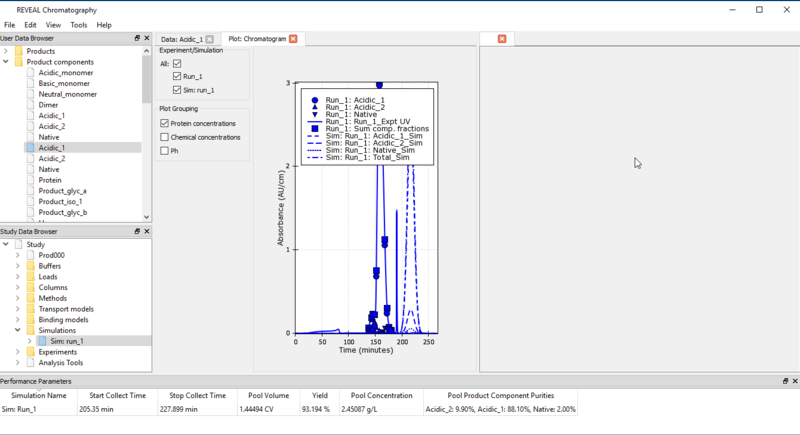 The central pane has a tab-based view, making it easy to switch back and forth between multiple open displays of chromatograms and experimental or simulated data. 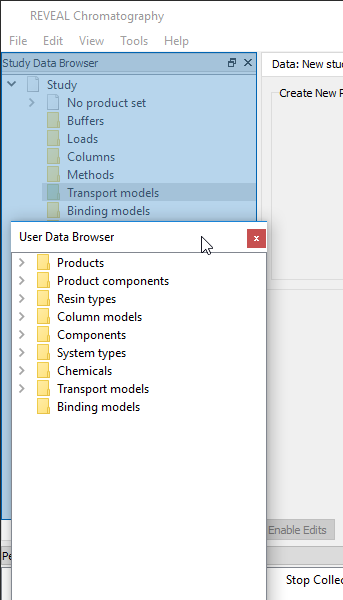 To view additional objects as central pane tabs, users can double-click on these elements in The User Data browser or The Study Data browser. 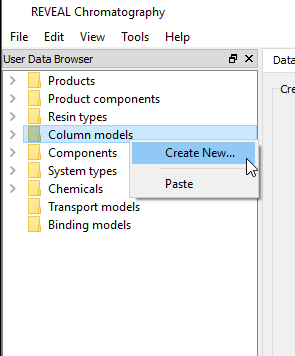 The User Data browser displays study-independent parameters and is where the user defines the properties of the components of the system to be studied. These include the properties of products, columns, resins, systems, and chemicals. 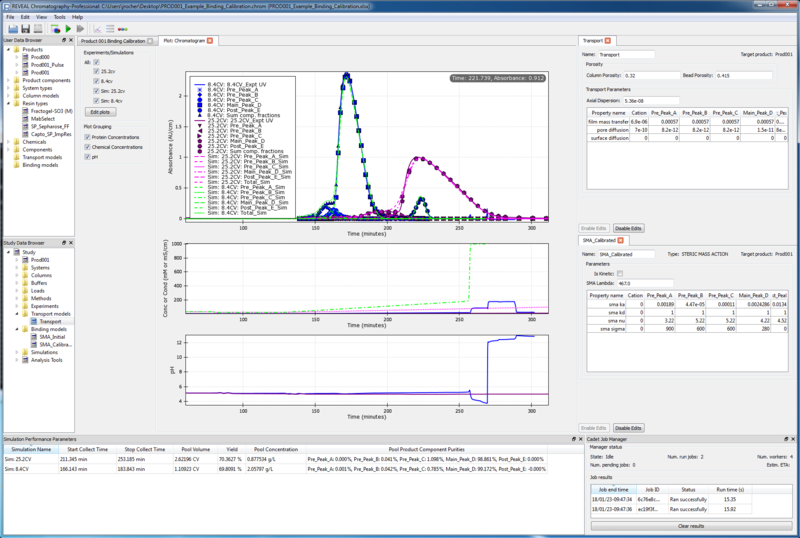 To complement the User Data browser, the Study Data browser contains study-dependent data elements, simulation tools, and analysis tools. 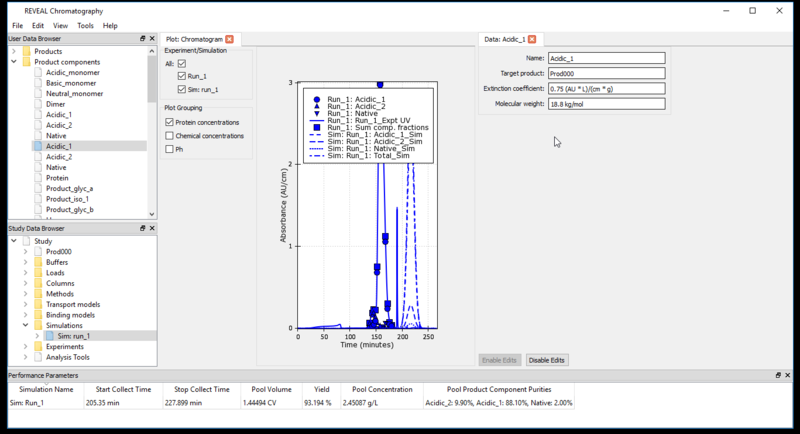 These data elements include study-specific buffers, purification method descriptions, binding model(s), and transport model(s), as well as experiments and simulations made from these elements. 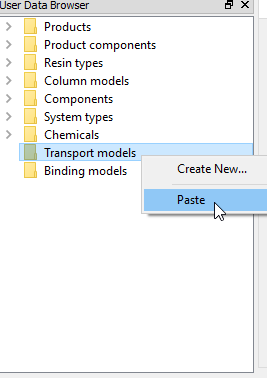 Note that transport and binding models can be stored in both browsers. Though they are typically developed in a specific study, they may be saved in the User Data, for sharing across studies, or with collaborators. This is done by copying and pasting these elements from one browser to the other. Many browser elements may be copied and pasted into other locations by right-clicking on the element, selecting Copy , and then right-clicking on the destination folder where the user wishes to paste the element and selecting Paste . 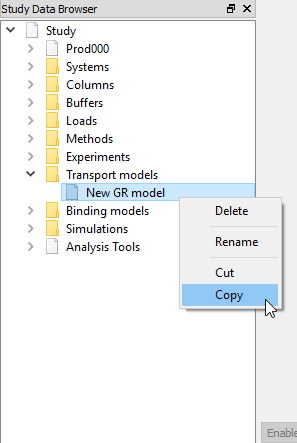 This can be useful to save, for example, a simulation from a simulation grid or an optimization step into the study simulations so as to retain it for future use. See the Saving your work section for more details about when that is needed. 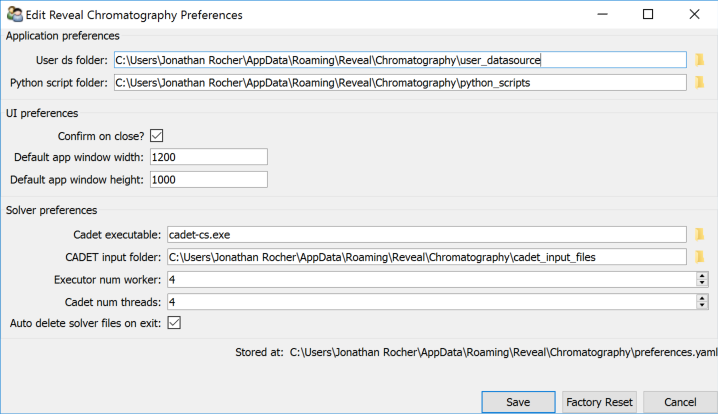 There are many ways to customize Reveal Chromatography’s user interface. Double-click on an un-docked header to dock the window back into the main interface. 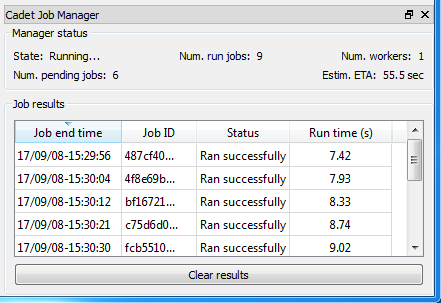 Users can create a tabbed view of the data browsers by undocking a pane, and then laying it on top of another pane. 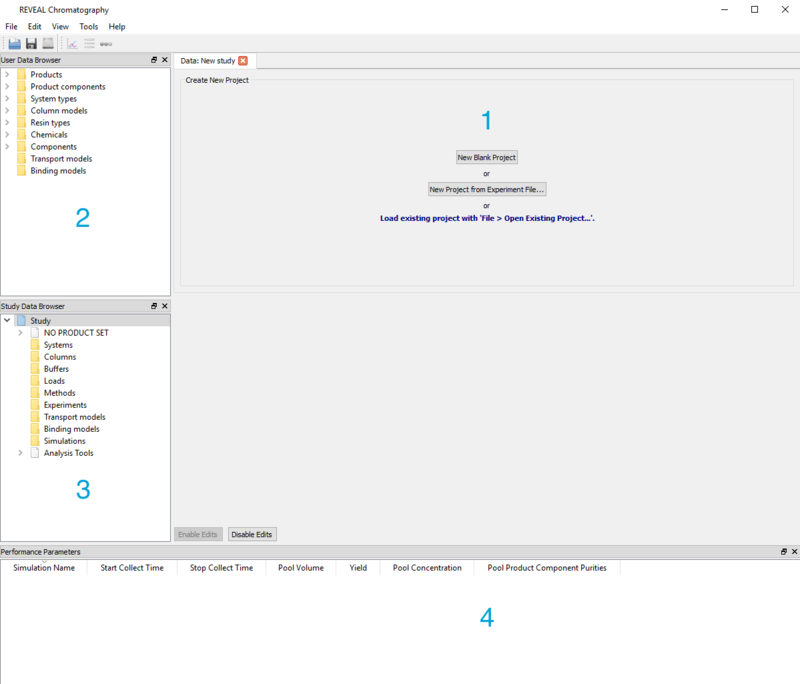 The application preferences allow users to control where application files are stored. To access documentation for the specific version being used, navigate to Help > Open documentation... . There, users can access the full documentation for the version they are running, even if the machine running the software isn’t connected to the internet. For connected users, the most recent and updated documentation can always be found at http://reveal.kbibiopharma.com/chromatography/ . 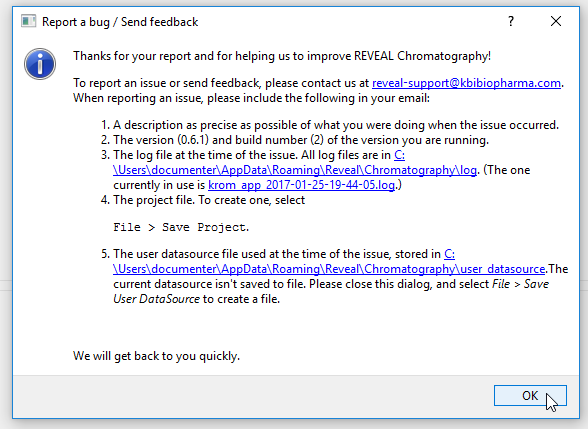 Reveal Chromatography is a software that is under active development. As such, it is possible that users may encounter issues or wish to propose improvements to the software. 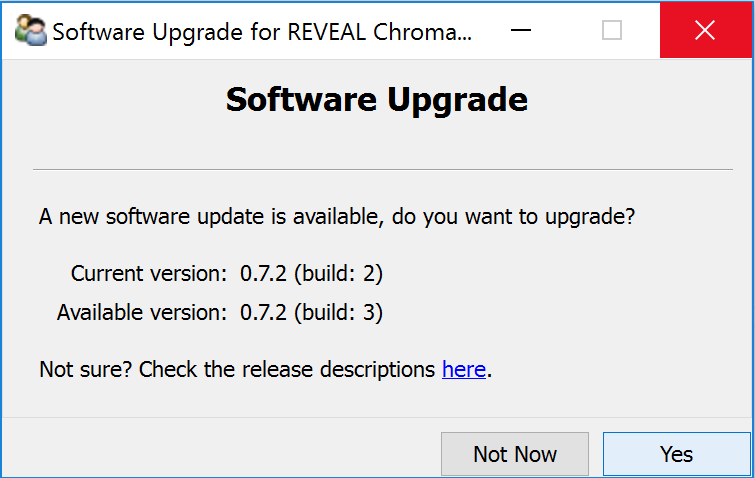 Users are encouraged to report any issues and feedback to the Reveal team. To do so, navigate to Help > Submit feedback... .
To reproduce the issue, the project file and/or the User Data may also be needed to provide a prompt resolution of the issue, and will be requested in follow up conversations.